A Very Fine and Palatial French Belle Époque 19th/20th Century Gilt-Bronze Three-Light Wall Light with Frosted Glass Globes. 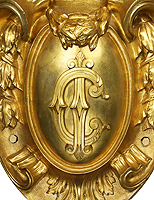 The allegorical ribbon and laurel gilt-bronze shield centered with a monogram with the initials "C.I." surmounted with upper semi-circular gilt-bronze applique section, raised by a tri-form acanthus support, the rim centered with a fleur de lis design with three protruding torch-lights ending with acorn finial, all fitted with frosted glass globes. Circa: Paris, 1900.